Highlights 2013 Newmarket Mitsubishi Friendly Neighbourhood Roadhockey Challenge in Newmarket, Ontario, Canada. Proceeds go to the Mike Thorhnhill Award! Have you formed your team yet? Challenged someone? 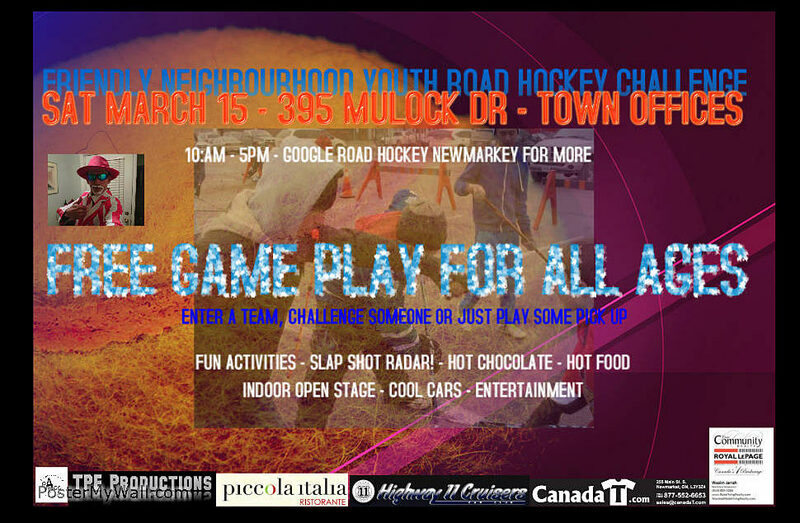 The 10th Annual Friendly Neighbourhood Youth Road Hockey Challenge, Ontario’s longest running ball hockey event, to be held this year at 395 Mulock Drive Newmarket, Ontario, Canada, at the town office building and parking lot. Be a Leader! Form a team and you could win a $ Award – The Mike Thornhill Friendship Award. “Hey You(th)! Form a road hockey team for the 2014 March Break Sat Mar 15 Friendly Neighbourhood Youth Road Hockey Challenge and you could win a cash Mike Thornhill Award! or just come out and play! No cost for entry. Challenge a team prior to form /play to increase your award chances as it goes to a pro-active community and schoolyard leader..like she or he who forms the team! Teams representing streets,neighbourhoods, churches,companies,schools,clubs and mixed gendered teams welcome. The Mike Thornhill Friendship Award is awarded in memory of a Newmarket youth killed by violence outside a donut shop several years back. No cost! NEW – Novices 7 – 12 yrs challenge. Cars by Highway 11 Cruisers Car Club! Tourney teams / players check-in at Newmarket Town Hall on Sat., March 15, by 10:00 am. For more info or to volunteer, call 289-221-0928. Please click here for more info about the Friendly Neighbourhood Youth Road Hockey Challenge.